Marshawn Lynch was fined $100,000 last week for not talking to the media. Beastmode, didn’t want to take that kind of hit in the wallet again so he decided this week to talk to the media….kind of. Lynch held court with a bunch of reporters mostly responding with “yeah”. Can’t hate on him for this hilarious interview. At least we all knew his objective and he did it in a funny way and it gave the reporters something to write about at least. Everyone wants to see the Manny Pacquiao and Floyd Mayweather fight. Even Manny Pacquiao does and he pokes fun at Floyd with this awesome Foot Locker commercial. Anderson Varejao was assigned to guard the inbounder last night at the end of the Cavs/Spurs game last night and showed off his Brazilian dancing skills. Well, he looked like Pinocchio with someone pulling strings on his arms and legs. Check out his smooth moves in this Vine video. Maybe we should start a kickstarter to free Varejao from his strings……and is Lebron Gepetto? Former #1 overall draft pick and modern Sam Bowie went to check out his alma mater Ohio St last night play some hoops. 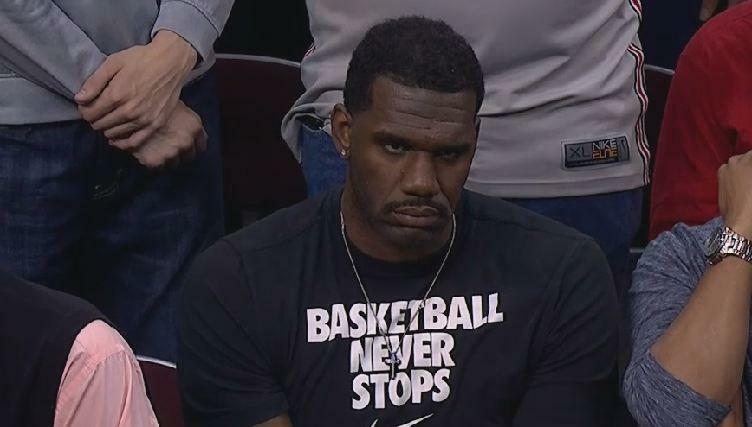 Oden almost broke the internet with a Nike shirt that said Basketball never stops (Sorry Kim, a naked booty isn’t the only thing that can break the internet) This is kind of like Bill Cosby wearing a shirt that says respect women or say no to drugs. Hopefully, Greg can find a job soon so we can make fun of him on the court and not off. Hulk Hogan hyped the Oracle crowd last night when the Golden State Warriors took on the Brooklyn nets. He’s been on the rounds in the Bay Area promoting Wrestlemania 31, which will be held at Levi’s Stadium next year. We are excited to see him back and looking as tan as ever, brother. Alex Morgan is one of our sport crushes at The Ocho and she recently had her bachelorette party in Mexico. Lucky for us, one of her friends posted some pictures so we can catch in on the fun and see what the soccer scoring beauty was doing while intoxicated with tequila. Nothing too crazy as the donkey show in these photos, but it’s always nice to see Ms Morgan in her bikini. The Cav’s haven’t been off to a hot start but they pulled out a win yesterday with Lebron James putting up a monster triple double last night. Kevin Love and Kyrie Irving celebrated the win with a cool handshake that ended them doing the “puff, puff, give”. The new big 3 might have more talent but, not sure if they are as mature or as dedicated as Dwayne Wade and Chris Bosh. Coach Lebron I mean Blatt probably is not pleased with this display of weed smoking, but i guess what NBA fan doesn’t believe they guys are smoking a J after the game. Cue the Snoop Dog.